BAGHDAD (Reuters) - The hallways of the Rusafa Central Criminal Court in Baghdad teemed with anxious toddlers on the days their mothers were on trial. Then they vanished again, into the women's prison, where they have lived for the past year and a half. They sleep on thin mattresses in crowded cells, bored, hungry and often sick. They are the foreign children of Islamic State. Obaida remains with his mother in a Baghdad women's jail, according to Russian government records. About 1,100 children of Islamic State are caught in the wheels of Iraqi justice, said sources with knowledge of the penitentiary system. The youngest, like Obaida, stay with their mothers in prison. At least seven of these children have died because of the poor conditions, according to detainees, embassy records reviewed by Reuters and sources familiar with the prison. Nadia Rainer Hermann, a German woman in her early twenties, serving a life sentence for belonging to Islamic State, told Reuters her two-year-old daughter spent her days on a dank mattress in a filthy and cramped cell in the women's jail. "I'm afraid every day my daughter might get sick and die," she said. The older children were angry and frustrated with their captivity, she said, and lashed out at the guards and one another. Aged 17, she fled separatist violence in Russia's Chechnya region and settled in France. Then, in 2015, after divorcing her husband – a man who, in her view, was not sufficiently devout – she said she set off on a tour of Turkey with some Russian women she'd met in a chat room. She left her three children behind in France, for what she said was a short holiday. A few months after Obaida was born, Iraqi and U.S. forces began a campaign to take back Mosul. By then, Gazieva was a widow and living in the northern town of Tal Afar, where she escaped the fighting. Once again, life was charmed, according to Gazieva and fighters and their families interviewed by Reuters. In Tal Afar, the women had chicken coops and friendly neighbors. "It was a good life," she said, "except for the bombings. But when I was a child, there was a war in Chechnya, so I'm used to bombings." Things changed in August 2017. Iraqi forces had taken back Mosul and the fighting moved north. 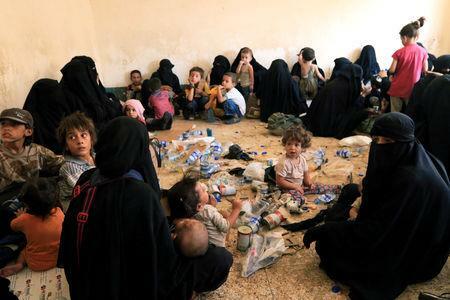 Women, children and the remaining Islamic State men fled from Tal Afar through Kurdish-held territory towards the Turkish border. They traveled on foot in groups of 20 or more, describing a harrowing journey which lasted days, walking on roads strewn with body parts, drones buzzing overhead. They said they had been told by diplomats and friends who'd made the trek in the weeks before that the Kurdish Peshmerga fighters would let them cross into Turkey. Instead, they were made to surrender.